NMM 1270. Dudy (Bock), Bohemia, ca. 1850. Single cylindrical chanter, 6/1 with one vent hole. Drone and chanter with cow-horn bells. Leather and wood bellows. Single reed in chanter. Arne B. Larson Collection, 1979. 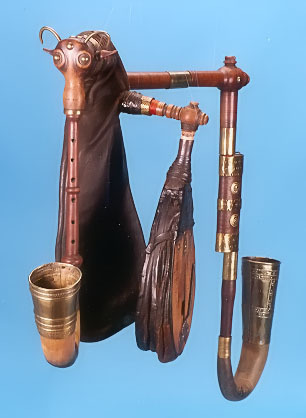 This bagpipe is the kind that is used to play folk music in the Chodsko region (in and around the town of Domažlice), in southwestern Bohemia (The Czech Republic), often in combination with violin and clarinet. The bellows, held under and pumped by the performer's left arm, supplies air to the bag, which, held under the right arm, supplies a constant supply of air to the reeds. 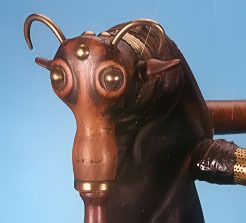 The drone pipe, sounding a constant pitch, is carried on the player's right shoulder, while its bell hangs below and behind. The chanter, on which the melody is played, is held directly in front of the piper. 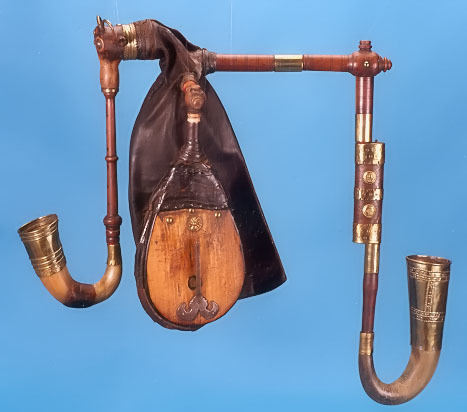 The goat's head, typical for bagpipes of this type, almost always has eyes, ears, and horns. This example even has nostrils.